Who doesn't love and remember the beautiful song "Puff the Magic Dragon" from when we were kids? Even though there is a sad element to this song, I've always enjoyed singing along. Big Brother, who loves to sing, has also been really enjoying the song these days. A few years ago we bought a beautifully illustrated version of the song as a book which also came with a CD. The words are the original lyrics as written by the song's creators, Peter Yarrow and Lenny Lipton, which mean that often we sing it aloud as we read. What we love best is at the end a little girl returns to find Puff, and there seems to be a grown-up watching from the distance, who although may be now an adult, resembles Jackie Paper as a child. 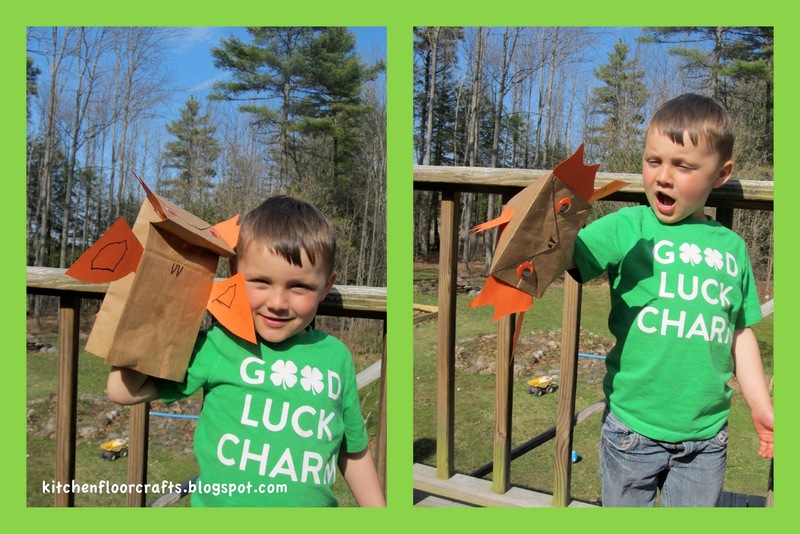 For this week's Quick Pick and Project of the Week we decided to create a Puff paper bag puppet. The materials are pretty simple: construction paper, paper bag, googly eyes, glue, and markers. Material note: brown paper lunch bags would work best, although we reused a small bag from a gift shop and just cut off the handles. I've used paper bags in my classroom as a way to create easy animal puppets, but this was our first one we've made at home. For our dragon we cut out back scales, ears, and wings. (These are pieces I cut to make a second one, Big Brother wanted his to be all orange.) You could also cut out a tongue or fire. Use a marker to add some details like nostrils and lines on the wings or ears, or you can even add teeth. Finally, enjoy the puppet! Sometimes our dragon was friendly and sometimes our dragon was roaring. How about you, do you remember the song? Or do you have another favorite childhood song you can still remember? We'd love to see a list of your favorite kids' songs below!